There's no need to steer while floating down Hanamaulu Ditch in an inner tube. Just sit back, enjoy the ride and be prepared to make a splash. Christmas was always great fun when my son Matthew was a toddler. He'd open a pile of gifts in five minutes flat, often more entertained by the act of tearing off the ribbon and paper than the gift itself. One year, he received an educational toy that came in a cardboard box splashed with bright colors. I tried to interest him in a lesson on shapes by putting the square piece in the square hole, the triangle in the triangular hole and so on, but had no luck. Matt preferred playing with the cardboard box! » Cost: $100 per person ($80 for kamaaina), including lunch at a picnic area with a freshwater swimming hole. Lunch consists of a ham, turkey, roast beef or vegetarian sandwich; chips; cookies; and juice or bottled water. » Notes: Participants must be at least 5 years old, 43 inches tall, weigh less than 300 pounds and must be able to stand independently both in and out of flowing water, walk up and down a few steps and on uneven terrain without assistance, and balance in a sitting position in a tube for at least an hour. In addition, you must be able to see and hear while tubing so that you can duck, change directions to avoid obstructions and follow other simple instructions. Children under age 16 must be accompanied by a parent or legal guardian; this tour is not recommended for those who are claustrophobic. Gloves, headlamps, helmets and tubes are provided. Wear a swimsuit or clothes that can get wet, water-friendly shoes (no slippers), and sunscreen and bug repellent. Shoes and wetsuit tops can be rented. Bring a towel, waterproof camera and change of clothing. Tours go out rain or shine unless inclement weather raises safety concerns. 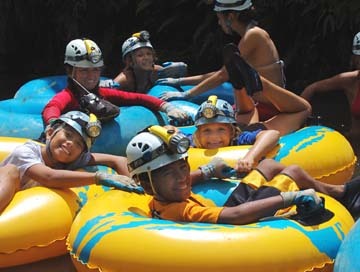 More than two decades later, that memory brought a smile to my face as I floated down the Hanamaulu Ditch on a blue rubber tube with 18 other participants on Kauai Backcountry Adventures' Mountain Tubing Adventure. In this day and age -- when amusement for many people comes in the form of iPods, Wiis and HDTVs with Blu-ray -- we were happily occupied with the simplest of toys. There was no need to worry about steering or propelling our sturdy vessels; they were carried along by the gently flowing water. We spun around in our tubes, glided into each other and bounced off the sides of the channel, all the time giggling and hollering in delight. It was like being in bumper cars on water! Bordered by ferns, hau shrubs, and guava and albizzia trees, the four-mile irrigation ditch was hand dug with picks, shovels, axes and sledgehammers in 1870 by Chinese laborers who earned 49 cents per day. We cruised down two and a half miles of it, our hearts pumping a little faster as we went over a mini waterfall and through five tunnels ranging from a quarter mile to a half mile in length. The tunnels would've been pitch black had it not been for the light beaming from headlamps strapped onto our helmets. Some of the tunnels and flumes were carved out of mountainsides; others were constructed with hand-cut rock and grout. "They're an amazing feat of engineering," said Chris Ryer, general manager of Kauai Backcountry Adventures, who has guided the tour close to 200 times. "If you look at the walls by the exit of the last tunnel, you can see pick marks in them!" DRAWING WATER from lush Mount Waialeale, five miles away as the crow flies, the Hanamaulu Ditch was part of Lihue Plantation's impressive 51-mile irrigation system. The plantation was founded in 1849 by a group of investors that included Charles Reed Bishop, founder of Bishop Bank (now First Hawaiian Bank) and husband of Princess Bernice Pauahi, the last descendant in the Kamehameha line. Cane was king in Hawaii from the mid-1800s to the mid-1900s. Plantations statewide began shutting down in the 1980s as competition from foreign countries made sugar production no longer feasible. 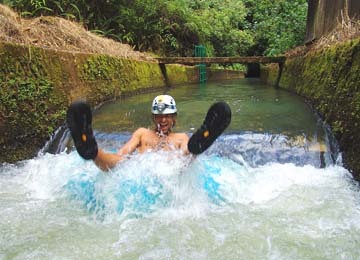 Lihue Plantation closed in November 2000, and today, water from the Hanamaulu Ditch is used for farming and cattle ranching; federal, state and county projects; and, of course, the three-hour Mountain Tubing Adventure, the only activity of its kind in the islands. Floating down the Hanamaulu Ditch can be like playing bumper cars on water. Kauai Backcountry Adventures has exclusive access to 17,779 acres of former Lihue Plantation agricultural land, a section of which opened in January 2003 for the tour. On the 25-minute drive from the company's headquarters to the start of the tubing, stops are made at lookouts that showcase the verdant beauty of Kauai. Said Ryer, "You can get great photos of the Lihue Koloa Forest Reserve; Waiahi Stream; Iliiliula waterfall, which feeds the ditch; and Mount Waialeale and its 5,243-foot peak Kawaikini, the highest point on Kauai. This spectacular area isn't open to the general public, so our tour is the only way you can see it." The actual time in the ditch runs about an hour. Measuring 42 inches in diameter, stable and reliable, the tubes provide a safe, fun and relaxing ride. "It's unlikely that you'll capsize," said Ryer, "but if by chance you do, the water depth usually is only around 2 to 3 feet, shallow enough for you to stand up in it." This makes the Mountain Tubing Adventure ideal for participants of all ages; four generations of a San Francisco Bay Area family booked it this past spring. "There were about 20 of them, and the tour was something they all could enjoy together," Ryer said. "I'm not sure who had more fun, the 80-year-old great-grandfather or his 8-year-old great-grandson! "When they reached the 'play area' outside the last tunnel, the great-grandfather got out of his tube and was trying to tip everyone else out of theirs. That's what this tour is about, hanging loose and being a kid, no matter what your age!"